Sometimes your words are best expressed by your gift. 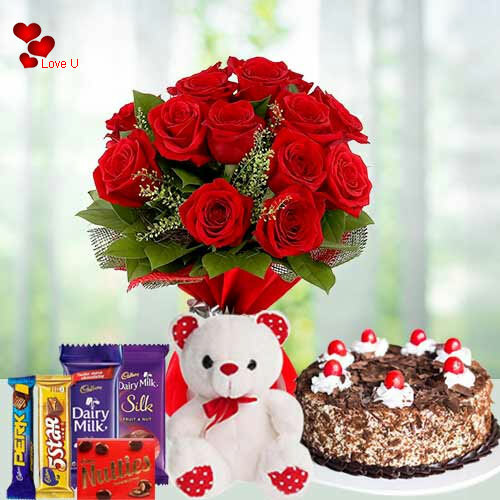 Send this charming arrangement of 12 Exclusive Dutch Red Roses Bouquet with 1lb Chocolate Cake, Cadburys Assorted Chocolates and a Cute Teddy Bear to your beloved on this Valentine and tell your untold words.Your loved one is really special to you. Flowers Delivery Nawashahar, Send sweets Varanasi, Wedding Cake Dindigul, Diwali Mithai Tuticorin, Send Flowers and Gifts to Lucknow, Online Shop Zirakpur, Flower to Karauli, New Year Flowers Vapi , Fresh Fruits Modinagar, Send Gift Solan, Dry Fruits to Kakinada, Birthday Delivery Kozhikhode, Sending to Kodaikanal, Flower shop Ankleshwar, Hanumangarh Online Cake Delivery.